Cozy Family-friendly Log Cabin With 25ft Interior Fireplace + Modern Amenities. 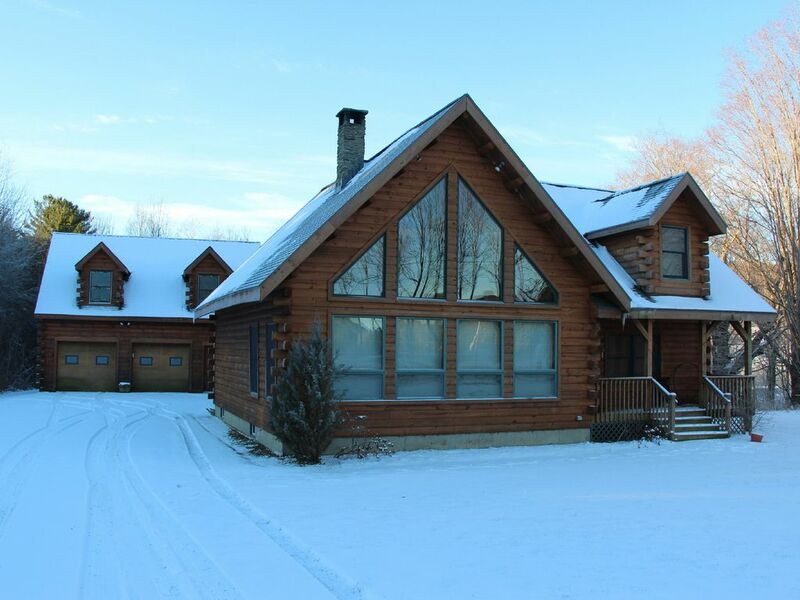 This 12 year old, cozy log home on 2 acres with porch has living/dining areas on the first floor (radiant heat) with large fireplace, a master bedroom suite with queen bed & 2 person INDOOR jetted jacuzzi (NO outdoor hot tub), plus a second bath with shower. The kitchen has all modern appliances/amenities with a large dining table that is adjacent to a sun-room that also contains a gas log stove with an additional table & chairs. [Wireless access & prime satellite TV on both floors.] The second floor has a large loft with cathedral ceiling, couches & queen futon & tv. Adjacent are 2 additional bedrooms with cathedral ceilings, each with queen bed & one shared bath with 5 ft long shower. The exterior contains a 2-car garage with loft. Exterior fire pit adds to a relaxing summer/fall evening. My wife Debbie are semi-retired educators, live in central New Jersey where we enjoy family and travel frequently. We have owned this property for 35 years and decided to rebuild from a small cabin to this more than two thousand square foot real log cabin. A year after building the new cabin, we added a real log garage. Radiant heat on 1st floor. Hot water baseboard on 2nd floor. Floor to vaulted second floor ceiling. Kitchen has large island with 6 chairs & GE appliances. Large table that seats 8 comfortably. Fire pit included for relaxing evening. 1-2-person indoor Jacuzzi There is NO outdoor hot tub. We are from a rural area, but currently living in a city due to our jobs. It was so nice to get off the grid and reconnect in such a beautiful cabin! We had everything we needed in a very spacious and clean place. Very relaxing getaway! This is home combines authentic log-cabin charm and modern amenities. We would certainly return here and encourage others to do the same. We had a great stay at this lovely home. We were two families and stayed here over New Year. The home had everything you could wish for and plenty of room for all 8 of us. Lots of room for the children to play outside and to explore the surrounding area. We would highly recommend this home to any discerning traveller looking for a warm and cozy log cabin stay in Vermont. We usually stay in Vermont the week after Christmas and have stayed in many different homes . This Home was a " Wow ," very nice , clean and cozy just a perfect location , isolated but not too far away from fun things to do , I would highly recommend this property to anyone looking for a Beautiful Vermont get away ! This cozy cabin was a great Christmas rental for our family. There is plenty of sleep space and bathrooms, a large open kitchen with a dining table for 10, a comfortable great room with beautiful central fireplace, laundry facilities, and an attached heated porch for all of our outdoor gear. Our hosts had plenty of firewood available (bring firestarter logs), had a beautiful lit Christmas tree up for us, and plenty of board games available for spending relaxing holiday family time. The manager lived next door and was lovely and helpful (connected our wifi and cable), it was reassuring to know someone was there if there were any issues (which there weren't!). We were 20 minutes from hiking (White Rocks National Forest in Wallingford) and skiing (Okemo), and 30 minutes from Manchester. There are horse farms and working farms within walking distance. The DeMattias were gracious and responsive, no issues. Would definitely rent again! This cozy log cabin has all the amenities with beautiful Green Mountain views, close to historic sites such as Hildene in Manchester, and skiing - Pico/Killington or Okemo. State parks and lakes are also within short drives. A copy of signed agreement will be provided after all have signed. Call for reduced rate for extended stays.